So, I finally dun did it. I was racing motocross Sunday (Aug 3rd, was also my birthday) when the throttle on the CR500 stuck wide open... The bike looped out, sent me HARD on my back, rotated forwards to my right temple, and then HARD on my back again. Pulled off the track, loaded everything up, and went home. Decided to go to the ER on Tuesday because the back pain wasn't going away. 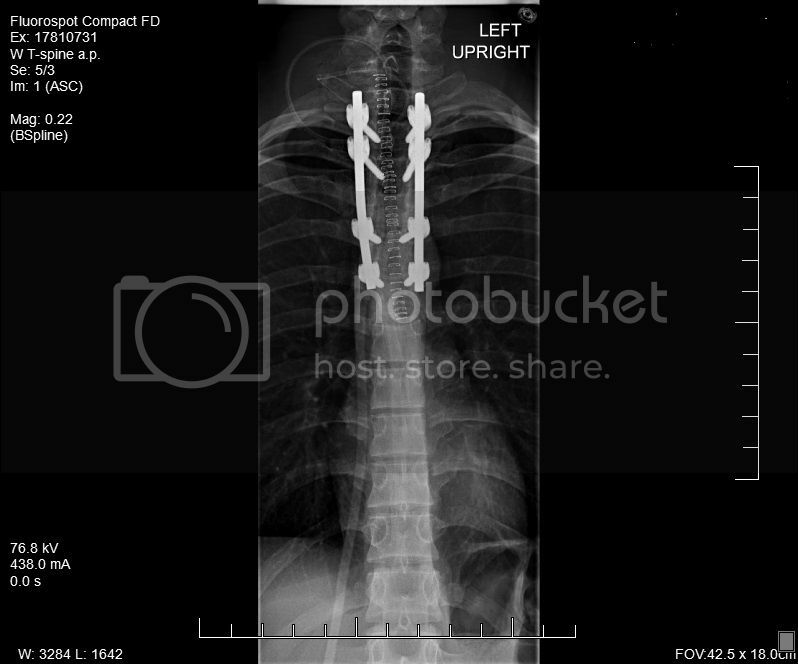 Turned out I had broken my T-4 vertebrae, and fracture my T-2,3, and 5. (I was WALKING like that for two days!!) Had surgery last night and now everything is held together by screws and plates. I'm up-ish and about in the hospital now, walking around, harassing nurses, the works. Should be sent home Sunday or Monday. Wow! Glad to hear you're doing better. OUCH!!! Back trauma is no joke; take care and hope you have a quick recovery. Take care of yourself and yes that video is just sick. Wow Eli, that was a good get off, get well dude! Here's an X-Ray post surgery. Oh, not so bad now that I see the pics…pu$$y. Rub some dirt on it! Wow, is that stuff going to stay? Or dose it come out later? Heal up and get back on the track soon! That 500 2 smoker is a monster of a bike. Did the Leatt break at all in the crash?